The coarsest sedimerits were deposited in n the channels of the fastest flowing rivers while finer sediments, after prolonged sorting, settled on the river banks and the delta front. The finest clay particles, carried in suspension by the rivers, were either washed overbank or taken out to the sea to settle slowly. Each thin bed of clay became black or grey shale, after burial by later deposits. The beds are so fine that the bedding is described as laminated. Clay minerals are rich in iron at some horizons, so the black or dark grey shales often have a brown or yellow colouration when exposed to weathering at the surface. Marine animals were easily fossilised in this low energy environment where there was a lack of wave or current action. Bivalves, brachiopods and goniatites are common in the shale beds (called marine bands) where the huge numbers of fossils found must have resulted from a change in the animals’ environment at the time. 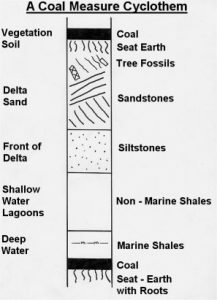 Lithification takes place at depth after the sediments of sand and clay have been laid down, when the water is squeezed out by pressure from later deposits. Cracks and fractures known as joints are caused by movements and stresses within the earth’s crust. When rocks are exposed to weathering, joints at or near the surface are opened up. Shales are fissile, which means they split easily along their bedding planes and often crumble when the joints are close together. Massive sandstones are particularly resistant to weathering and often form scars and cliff features called edges in the district. 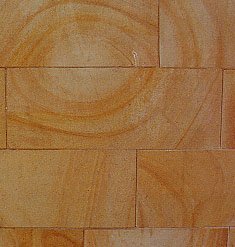 Sandstones vary in colour from pale grey Huddersfield White Rock to the rich orange of the Readycon Dean and the Rough Rock sandstones, the latter to be found in Beaumont Park and Longwood Edge.Liesegang Rings This colouration and staining results from iron in the shales moving in solution during burial and compaction of the sediments. The joints and bedding planes within the sandstones provide an easy route for the iron solutions to move. This may then be deposited as brown iron staining (Liesegang Rings), which can readily be seen on the freshly quarried stone and on flags made of Greenmoor Rock in St. George’s Square, Huddersfield.